Simon and Jiyoun -- BFF! and E! Our ceremony and reception will be at the Headlands Center for the Arts, Building 944, in the Marin Headlands. The ceremony will begin at 3:30 pm in the East Wing. Please join us for drinks and nibbles afterward. Dinner will start at 6 pm; music, drink, dessert and dancing will continue until 10. Congo lines are strictly forbidden. After 10 pm, the Marin Headlands Hostel Annex will be open to everyone (see where to stay). From the city, take Highway 101 North (Route 1 N) over the Golden Gate Bridge (it's free for travel north, but a $5 toll will be charged on the return leg) to the Alexander Avenue exit, the first exit past the bridge lookout point. Bear right, toward Sausalito, then take the first left (towards Marin Headlands and Fort Baker) onto Bunker Road (further directions below). Take 101 South (Route 1 S) to the fourth Sausalito exit, the last exit before the Golden Gate Bridge (which will be visible ahead), toward Golden Gate National Recreation Area. At the stop sign turn right toward Sausalito. After passing under the highway, turn left onto Bunker Road toward the Marin Headlands and Fort Baker (see below). Pass through the slim, one-way tunnel. You may have to wait a while -- up to five minutes -- for the tunnel to clear of oncoming traffic. 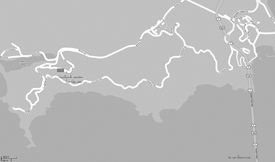 Two miles after the tunnel, make a soft left-turn at Field Road (towards Point Bonita Lighthouse). Take the first left onto Bodsworth Road (the park's Visitor Center is on your right) and another left onto Simmonds Road. The Headlands Center for the Arts, Building 944 is the second building on the left hand side of the road. This route will add about 20 minutes to your travel, but the bridge and bay vista it offers is dramatic and worthwhile. From either direction, turn left (southward) at the stop sign after exiting 101 and bear right (if you're coming from SF this will take you beneath the highway). Bear right; this road becomes Conzelman Road, which follows the bay coastline. After a slow 3 mile drive, take a double-right to U-turn onto Field Road, and the following right again at Simmonds Road. There will be signs to help you find the Center for the Arts, which is the second building on the left. 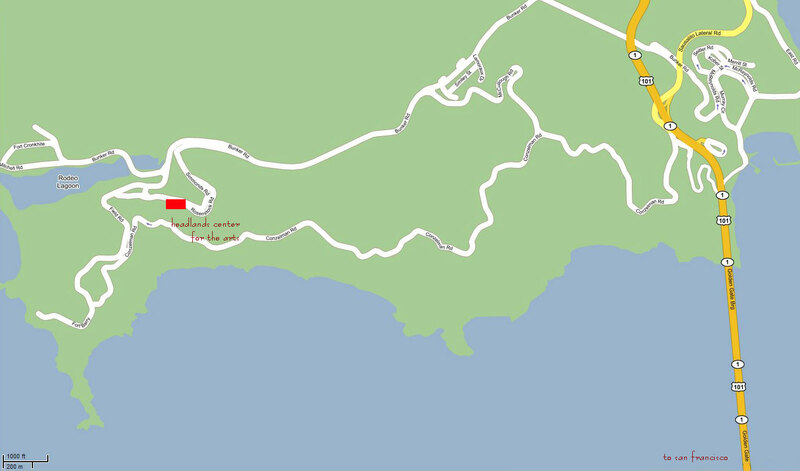 Note: a long stretch of Conzelman Road is one-way, so this route is best taken while travelling into the Headlands. Please note: Entering "944 Fort Barry, Sausalito, CA" into Google Maps, MapQuest, or Yahoo! Maps will generate directions that take you past the Center of the Arts to the Point Bonita YMCA.